Boat security is a big deal in New Zealand, trailer boat theft happens year-round regardless of whether your boat is in use or parked up during the off season. Your boat is one of your biggest assets and it needs to be protected. Use our guide on protecting your boat to lower your chances of becoming a victim. Never leave your keys in the ignition, it’s simple but some boat owners still forget this first step in basic prevention. Even when your boat is safely locked down, don’t leave the keys in the ignition or anywhere else inside the boat. They should be kept hidden inside your alarmed house. While most thieves won’t care if the keys aren’t included with the package, we don’t plan making life easy for them. For the best protection, get a tracking system or anti-theft alarm for your boat. Before purchasing, do the research on the best alarm system and model that fits your needs and budget. Reliable boat security systems are not cheap – costing between $1500-2500, though they can be worth the investment depending on your boats ticket price. One of the top companies in marine security systems is GOST (Global Ocean Security Technologies) this is the marine division of Paradox – a world leader in home and commercial security alarms. GOST have a wide variety of alarms, many which are specially designed for trailer boats. Tramigo are a respected international company specializing in tracking units used in vehicles and boats. Security Alert in Wellington are the suppliers for the Tramigo tracking system. At $549 a unit they are competitively priced and well worth a look with virtually no ongoing costs. Put locks on your outboards and install a high quality trailer hitch lock or a deadbolt lock to make it harder for burglars to take apart. While it can be a real pain, especially during the high season, remove all your valuables from your boat. Never leave portable electronics, fishing equipment, and other expensive gadgets inside your boat when it’s not in use. Because it is a much easier heist, some burglars focus on stealing boat accessories and equipment instead of boats themselves. Boat parts and accessories are always in top demand so they are easy to turn into cash. 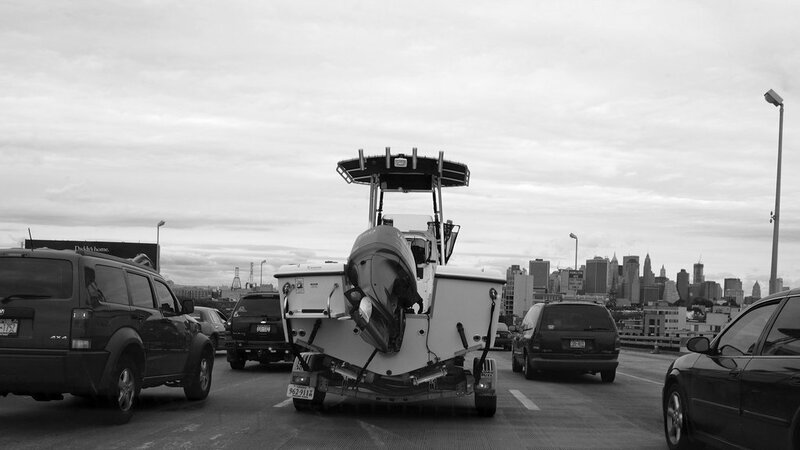 Ask a trusted neighbor to keep an eye on your boat if you’re going out of town. If selling your boat, don’t leave a “For Sale” sign on it especially when you’re away for a week or more. The most important thing is keeping your boat out of sight and away from street view. If you have a large garage or a shed that fits your boat this is the best place for it. If you don’t have a garage or secure indoor location to store your boat in, consider the next two options. Consider chaining the trailer to a tree and using a trailer wheel lock. While no trailer wheel lock will keep a determined thieve away, it will slow them down and cost them time to remove. Have a look at the SAS wheel clamp which is an extremely reliable and easy to set wheel lock. Another option if you won’t be using your boat for a long time is to jack up your trailer and and removing one wheel – just make sure you keep it separate form the boat. Park your trailer with the hitch inward, not outward. Again, if you don’t have a more secure storage location for your boat, you can park it in your car park or driveway. Position it in such a way that the trailer hitch isn’t immediately facing the street for a quick escape. If possible always block your boat in by parking another vehicle in front of it. Make an inventory list of all your boats equipment. Record all of your boating equipment in a log book including serial numbers and photos. Also include photos of the boat itself from different angles, be sure to include any specific details which make your boat easily recognizable. Keep all these records in a safe location, should your boat or equipment get stolen, you have the serial numbers and photos for proof of ownership and identification. Mark your boat and all equipment inside with the Hull Identification Number (HIN). Use a UV security pen or engraving pen to do this. Also, label all your boat equipment with your name, state, and contact number. Although doing this doesn’t exactly prevent trailer boat theft, its purpose is to make the process of recovering and identifying your stolen goods and equipment easier. Your boat is one of your most expensive and prized possessions. Although you can and should take out comprehensive boat insurance which includes theft warranty. It’s still up to you to secure your boat to minimize the chances of getting it stolen. If you have ever dealt with insurance companies in theft situations – you know it’s always an unpleasant and lengthy process. Time which your could better use out on the water in your boat!